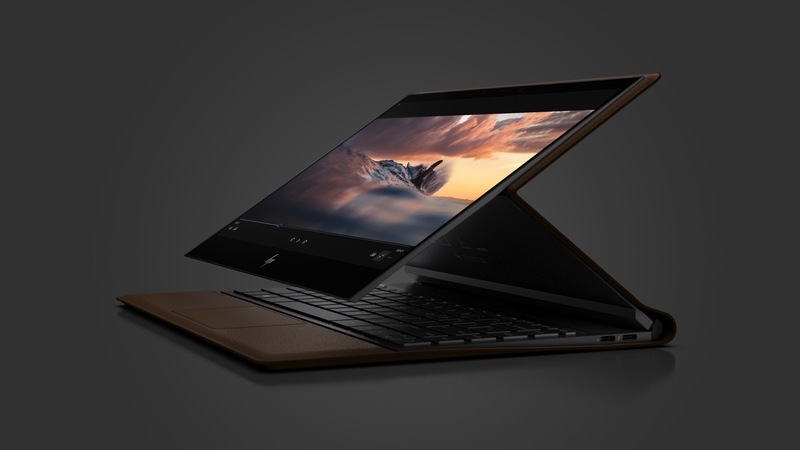 HP yesterday announced the Spectra Folio, a slim convertible PC that comes with an impressive leather design. The Spectra Folio is a PC clad in genuine leather instead of the everyday plastic or metal design we see. This leather design gives it a unique and premium appearance. This HP PC, according to how the user wants it, the PC can serve as a tablet, or it can be folded halfway to cover the keyboard so that the track alone are visible to the operator, or can also be used as a regular laptop. So what are the specs of this premium PC? The Spectre Folio will be the first device to use Intel's low power display technology which helps in reducing screen battery use in half. This PC comes with a monster battery. All thanks to Intel's low power display technology, the battery gives up to 19 hours of battery life on the Core i5 model, and over 17 hours on the Core i7. This is an "always Connected" PC. One thing you should know is that the Spectra Folio has a 13.3 touchscreen display though the screen differs across all three models. There is a version with a 1 watt FHD display, the second display comes with the regular FHD screen, while the third comes with a 4K panel. The display is covered in Corning Gorilla Glass and at the same time supports input via a stylus with tilt detection and 4096 levels of pressure sensitivity. The PC comes with 8GB of RAM and 256GB of storage (NVMe M.2 SSD). There is an e-sim and nano-SIM tray slot, and as well as four Bang & Olufsen speakers to give users premium sound. Other specs includes a 3.5mm audio jack, one USB 3.1 Type-C port and a USB 3.1 Gen 2 Type-A port and two Thunderbols 3 ports. Bluetooth 4.2, 802.11ac WiFi. The Spectre Folio measures 32 x 23.36 x 1.52cm and weighs 1.45 kg. The Core i5 model of Spectre Folio will be sold at $1300 on HP.com, while the Core i7 will sell for $1500 at Best Buy. The Spectre Folio model with 4K display will be available sometime around December later this year.